The yatra, which began at Dandi in Gujarat on October 2, will end in Delhi on December 10, International Human Rights Day. “There are 12,000 MW National Thermal Power Corporation (NTPC) and Reliance thermal power plants each in Sundergarh. There are plans to set up power plants of more than 70,000 MW capacity. The whole belt between Brahmani River and Mahanadi is rich in coal and then in iron ore in northern Odisha. The corporate and state nexus has eyes on all of this”, said Kalyan, a senior activist. “The three already installed hydro power plants have become example of ecological destruction. They don’t have adequate water due to which only a fraction of power generation is possible, and the dam is also not able to irrigate lands as promised. When the reservoir doesn’t have water for irrigation, how are Jindal and Bhushan able to get uninterrupted water supply?”, he wondered. “More than 26,000 acres of land have been acquired just for coal mining. There is a power plant with generation capacity of more than 8,000 MW in the area. People have been displaced because of the Hirakund dam. Pollution is becoming a major issue. Youth were promised employment, which is still a distant dream. 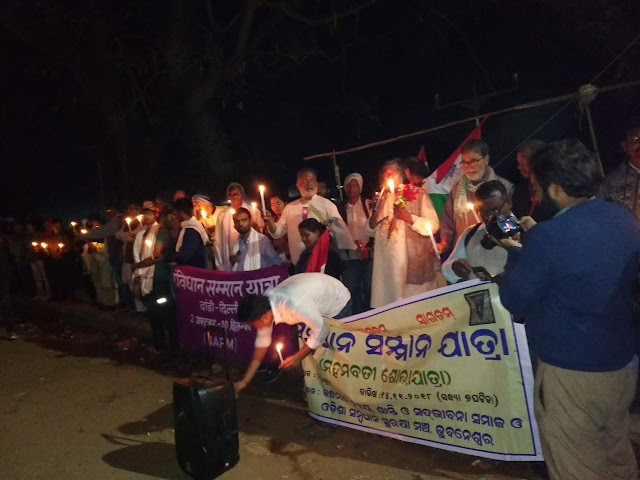 Majority of the population is adivasi and is facing poverty, while the government is shamelessly claiming it to be one of the richest districts of Odisha”, Lingraj Behra, convener, Paschim Odisha Krushak Sangathan Samanvya Samiti (POKSSS), said. “The main issue is of sharing of water from the Hirakund dam in the region and demand of loan waiver”, he added. 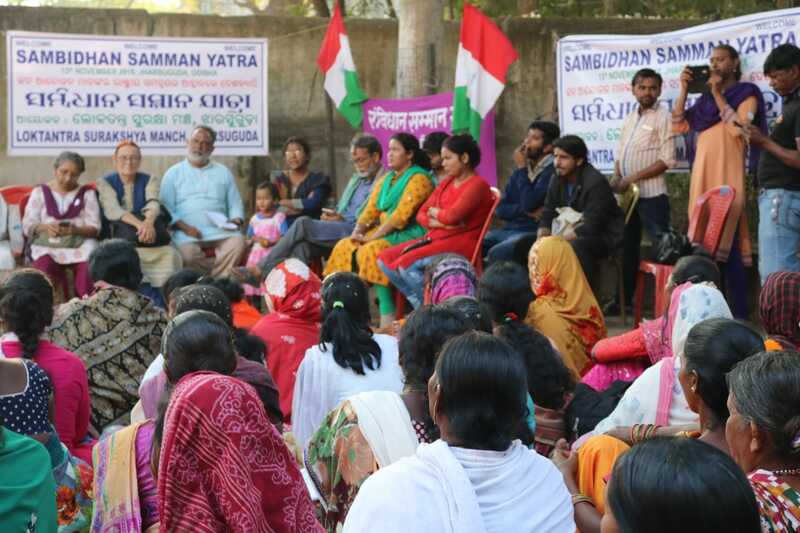 At Balangir, yatra activists learned about struggle against Sahara India’s 1,320 MW Titalgarh thermal power plant since 2010, which is stayed as per Supreme Court directions. Lower Suktel Dam is another such issue where people are strongly against the land acquisition since 2000. Thirty villages are getting affected as a result of this project. Here the Zindabad Sangathan has been struggling to get land entitlement for adivasis in Patnagarh and Titlagarh areas of Balangir district, the activists were told. “We need to understand and declare the state violent, extremely violent. They don’t even know how to respect our culture and traditions. We are the ones, who have kept the forests alive, rivers alive, the environment breathable. But what we are receiving is the beatings in the jail, bribes to cheat our people and sell our lands to corporates”, Sikala said.